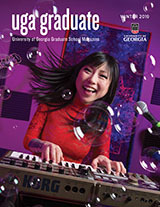 A graduate student who misses a graduation deadline by failing to file the Application for Graduation, Advisory Committee Form, and/or completed Program of Study Form will have the option of paying a single fee of $50 (check or money order in U.S. dollars) for late processing of all required forms. A completed Late Filing for Graduation Form, all required graduation forms, and the late fee payment must be submitted to the Graduate School Office of Enrolled Student Services within 45 calendar days of the original deadline. After the 45 day late period, no students will be added to the commencement roster for the current semester.